In the phone interview with AYC back in April 2013, I cued my interest in teaching someplace as rural as possible. Near impossible, we were to be placed along the east, the population zone. Yet whether they heard my plea or credit to a city selection list on my part, I got a mountain instead. Actually it's a hill. But it is a walk through the multifaceted China I have come to love. There are many routes up and around the mountain, some I am still yet to discover. I particularly like the one pictured above because A. It is near to my school, and B. There are three chickens and three goats I usually pass by. 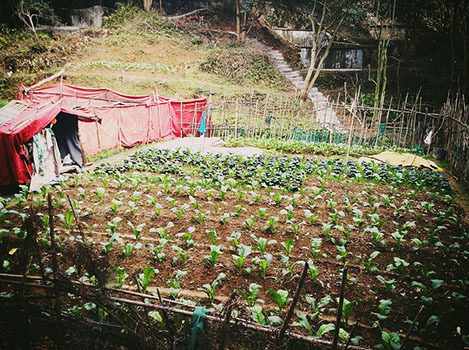 There are many farms and plots on the mountain, some I would equate to community gardens like we have back in the U.S. In fact, all throughout the city, almost any exposed piece of earth is cultivated. I call it "My Mountain" because I feel I have come to know it. Almost everyday, after class, I take a trip up here. I have become familiar with some of its routes, and have watched the trees change color, and the coming and going of different birds. In the beginning I was often stared at for being a foreigner, now I find that I am the one doing the staring. There are at least eight temples I've counted on the mountain. This one is called DingFengAn (定风庵), which I have taken with no language understanding at all to mean something about being stable in the wind. There are two nuns who live here, and a giant wolf-dog who sometimes stands at the gate. On this particular day the nun gave me an orange. I don't know if it was meant to be an offering or to be eaten, but I took it with me and ate it further ahead on the path. Above is one of many pavilions/lookouts along the path. Here is where I ate the orange, and looked out onto the city. Cityfolk come here to fill their jugs with water at the many wells and irrigated tubes scattered around the mountain. They say that it is a special water. Once in awhile along the way, the trees open up to a view of the city - Rui'an. It is hardly this clear, to see those mountains in the distance, and the river. But when the rains come they seem to wash the smog away. Rui'an (瑞安市) is a big little city, so I say. Its population is larger than the entire island of Oahu, where I am from. Despite its size, I still sense its smallness. The people, the language, the way of life, it is very much China. Fitness seems to be prevalent here, yet unlike America with the gyms and high intensity. It's hard to make a generalization, but people here like to stay active into their older years. 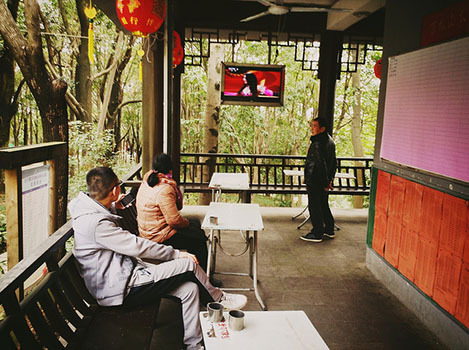 And it seems quite common in other cities I've visited in this part of China, to have a central mountain, or city parks, where physical health is catered to. My students like to tease each other. One phrase they use is "poor farmer." My interest is farming, and I've done it back home, but a fellow teacher told me on my first day not to mention it. It seems farming is looked down upon, and to say that to your students would add a confusing dimension to their thoughts about you. 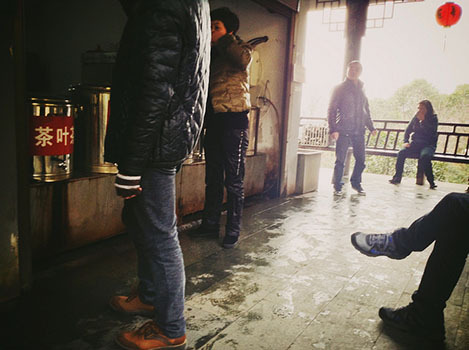 Having said that, the farmers I have come across here are some of the nicest faces I've met in all of Rui'an. Once, at this spot, I walked into an old man trimming firewood. He was amused to see a foreigner and kept talking to me in Chinese. I did not understand a word but pushed out in response, "Meiguo ren" and "laoshi" - American and teacher. He nodded then pointed towards his front door, motioning me to go inside to say hello to his wife. I stepped in the doorway and waved, his wife had a good laugh, shook her head at her husbands lightheartedness, then went about her business. Above, one of few designated tomb yards. I came up here one day to escape the noise of the city, specifically the car horns. Honking in China seems to be of the preemptive type, so it is an accustomed sound. Yet up here there was an unusual quiet which I could actually fall asleep to, and did. Two words to describe the mountain - tombs and farms. The entire mountain is terraced in a way to suggest that it has housed both for centuries. When I first got here in October they were all overgrown. With the recent New Year celebrations however, most were cleaned, entire families came up to pay respect - flowers, fruits, incense and firecrackers. The Tea Pavilion, offering free herbal tea. I am unsure of the type, but its taste is akin to the smell of the mountain. Being a foreigner in a strange land, making the mountain journey, teaching English to listless teenagers - all warrant being called a hero. But here, at the end of the day, I'm just a laowai enjoying his cup of tea, free wifi, and Chinese talent shows on TV.